FRANKFURT MUSIKMESSE 2010 PRESS RELEASE: When it comes to acoustic guitar tone and quality, nothing performs like an all-solid wood instrument. Harking back to the 1930's and their heritage, the Epiphone Masterbilt line combines traditional construction methods and features with premium all solid tone woods to bring you a new 'vintage' instrument with deep rich lows, shimmering highs and just the right amount of mids. While many other guitars in this price class use pressed backs, spliced neck joints and even artificial wood backs and sides, you can be assured that every Masterbilt holds true to it's all solid wood promise. Building upon this promise is the newest member of the Masterbilt line - the DR-500MCE model featuring an elegant rounded (Venetian) cutaway for easy upper fret access and state-of-art electronics. While the DR-500MCE sounds great unplugged, it really comes alive when plugged in thanks to the new eSonic2 preamp system. Made in cooperation with Shadow Germany, the new eSonic2 preamp features a built-in, easy to use tuner. When engaged, the guitar's output is automatically muted - with no popping noise - making it a perfect choice for stage use. You can even push in the tuner button and unplug the guitar without a loud pop. Other controls on this state-of-the-art preamp include Master Volume, NanoFlex Tone, NanoMag Tone, Stereo Blend, Low Battery indicator and a Phase switch to help eliminate unwanted feedback. The preamp uses two 2032 lithium watch batteries that are not only lightweight, but provide significantly longer life than old-fashioned, heavy 9V batteries. Under the bone saddle, is Shadow's proprietary NanoFlex, low-impedance pickup. Not a piezo, this unique flexible sensing material features integrated active electronics that not only picks string vibration but also top and body vibrations as well for a truly acoustic tone without the harshness of piezos. Complimenting that is the revolutionary NanoMag pickup mounted at the harmonic-rich, end of the fingerboard. Exclusively from Shadow, the NanoMag features 3 Samarian-Cobalt magnets and an integrated active circuit to capture all the highs and lows, including a wide range of harmonics. 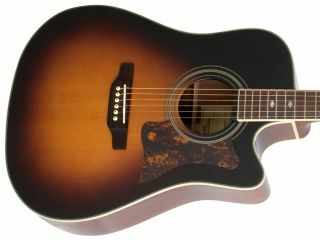 The DR-500MCE also has a solid Sitka spruce top, hand-scalloped Sitka spruce braces, mahogany kerfing, a 25.5" scale rosewood fingerboard and bridge, a solid Mahogany back and sides as well as a 20-fret hand-shaped Mahogany neck that joins the body at the 14th fret that is adorned with carefully cut, split-diamond pearl fretboard inlays. As with all Masterbilts, the DR-500MCE features Epiphone historic off-set headstock with stickpin headstock inlay. Other features included quality vintage-style Grover Sta-Tite 18:1 ratio machine heads, bone nut and saddle, imitation tortoise pickguard, nickel hardware and a bound body, neck and headstock. Players looking for vintage tone and vibe will appreciate the hand-crafted dovetail neck joint and hide-glue construction. It also features Epiphone's Limited Lifetime warranty and Shadow's 5-year warranty (electronics) and is backed by world famous 24/7/365 day Gibson Customer Service. The U.S. MSRP for the new Masterbilt DR-500MCE is $999 with an optional hard gigbag for $115. It will be in retail stores starting in May 2010.